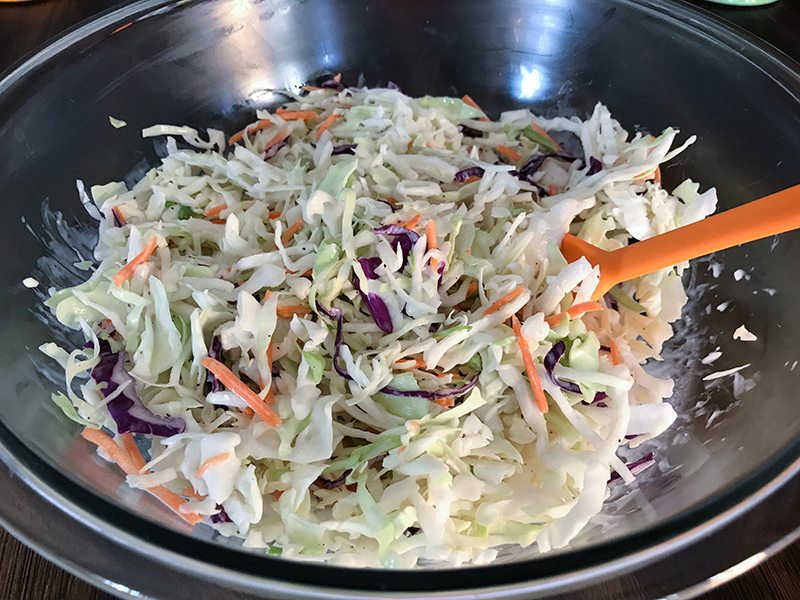 This is my favorite coleslaw recipe. It’s easy, super fast to make, and it tastes great. I’m very, very picky about how I like my coleslaw. I mean, I won’t turn down any type of slaw, let’s be real here. But I don’t like vinegar-heavy slaw, and I don’t like slaw with little to no dressing, and I don’t like slaw where all I can taste is the mayonnaise. 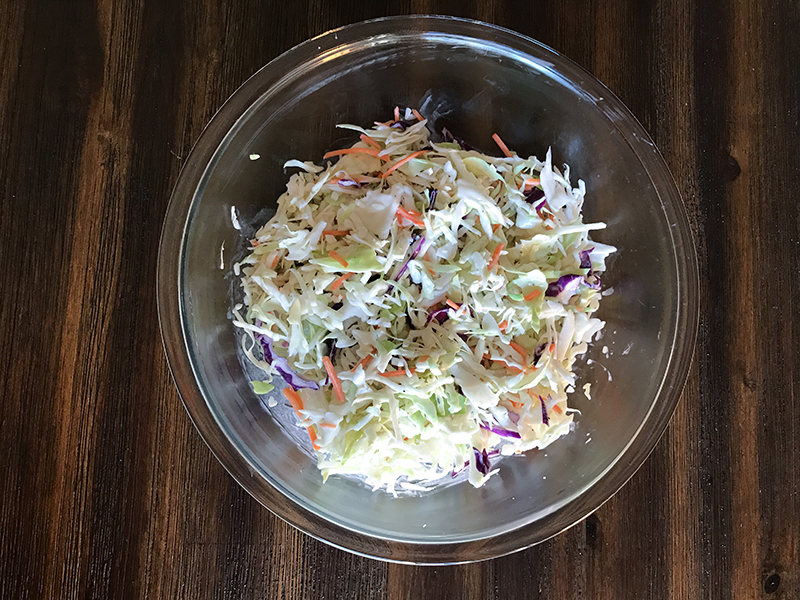 This coleslaw recipe is super creamy, but not overpowering. 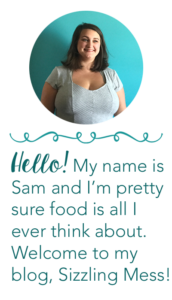 It’s good with fried chicken, ESPECIALLY Nashville Hot Chicken (which is how we ate it) because it will cool your mouth right down. And it would be excellent on a pulled pork sandwich. Or ribs. When we were eating, my husband pointed to everything on his plate and rated them. Nashville Hot Chicken: Good. Potato Salad: Great. Coleslaw: Best he’s ever eaten. So there you go! That’s high praise coming from someone who really, really likes slaw. Also, I know lemon sounds like a weird ingredient when there’s already vinegar, and like it won’t fit with the flavors, but I promise it will and you should definitely use it. Whisk all of your wet ingredients together in a large bowl until smooth. Make sure there are not any huge lumps of mayonnaise left. Add in your sugar and spices and whisk until combined, scraping the bottom of the bowl to make sure all of the sugar is incorporated. Add in your cabbage and mix to combine. Refrigerate for at least 30 minutes (the longer it sits, the better the flavor combinations will be, but it can also be eaten right away). *Hellman's mayonnaise is the best, in my opinion. It's the highest quality product you can buy at your regular store. 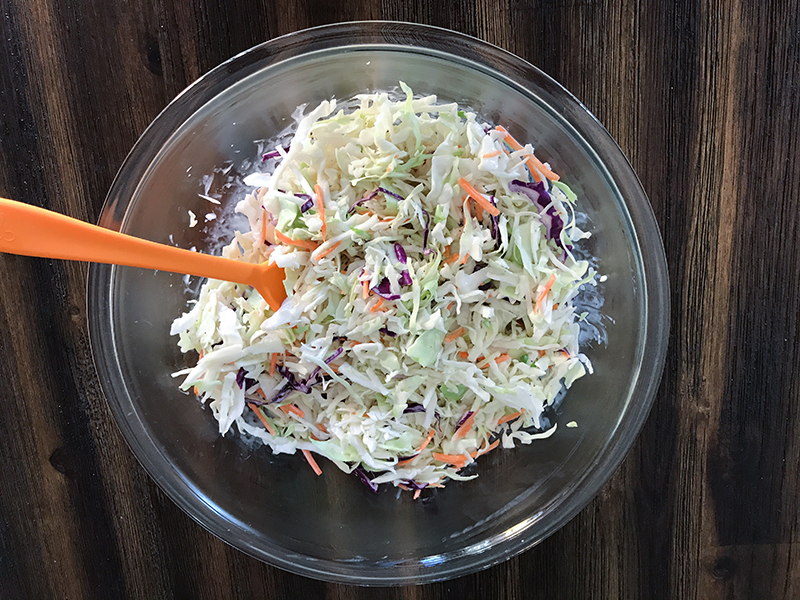 You can also shred your own cabbage and carrots if you'd prefer not to buy a pre-shredded bag, but if you want to use an entire head of cabbage you may need to double or even triple the dressing for this recipe. 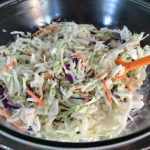 Broccoli slaw would also be excellent instead of the standard cabbage mixture!